It's fall, which means it's pretty much the season of the pumpkin recipes. While I have been making my super awesome delicious Pumpkin Coffee Cake a lot, I realized I hadn't even posted any new pumpkin recipes on here yet this year. The horror! Yeah, let's remedy that. The thing about pumpkin cookies in any form is that they always are pretty fluffy. 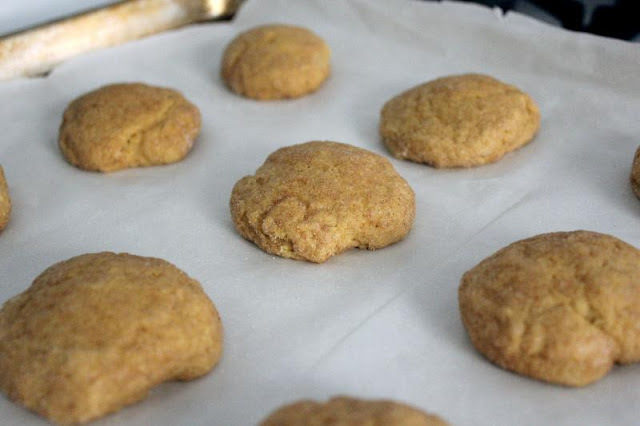 It must be something to do with the consistency of the pumpkin puree because my other Soft Pumpkin Cookies come out the same way. And it's not a bad thing at all, no siree bob, just perhaps different than a "regular" cookie. Nothing wrong with that. This recipe combines the classic pumpkin cookie with another holiday classic - the snickerdoodle. 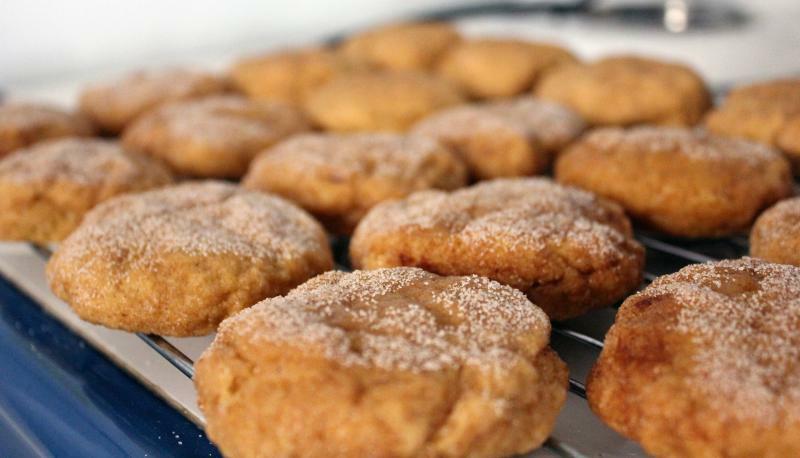 I'm not the biggest snickerdoodle fan myself (what does snickerdoodle even mean?! 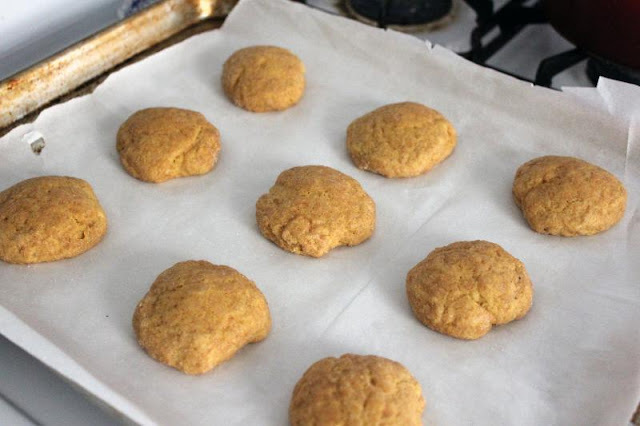 ), but since the spices of both work so well together, it's no wonder a Pumpkin Snickerdoodle is just the ticket for a warm and cuddly holiday cookie. What are some of your favorite pumpkin recipes for this time of year? Do you have any especial favorites that I should try out? Definitely let me know in the comments if you do! 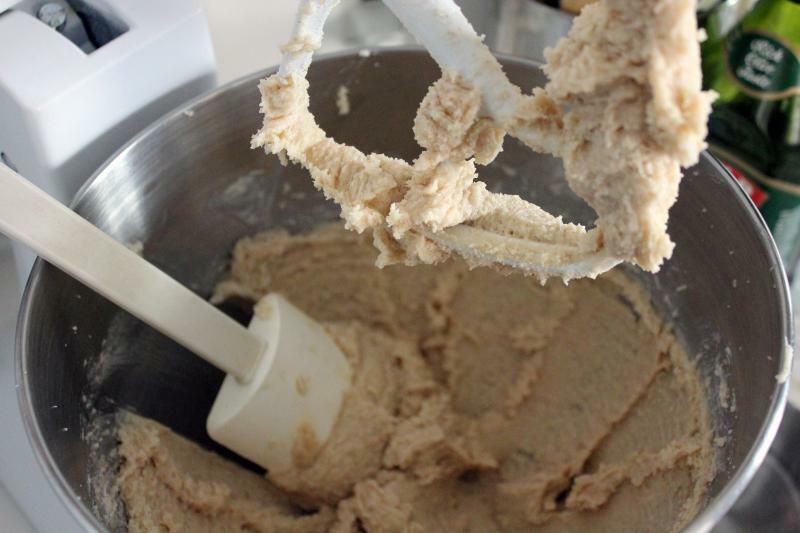 In a medium bowl, whisk together the flour, baking powder, salt, cinnamon and nutmeg. Set aside for now. 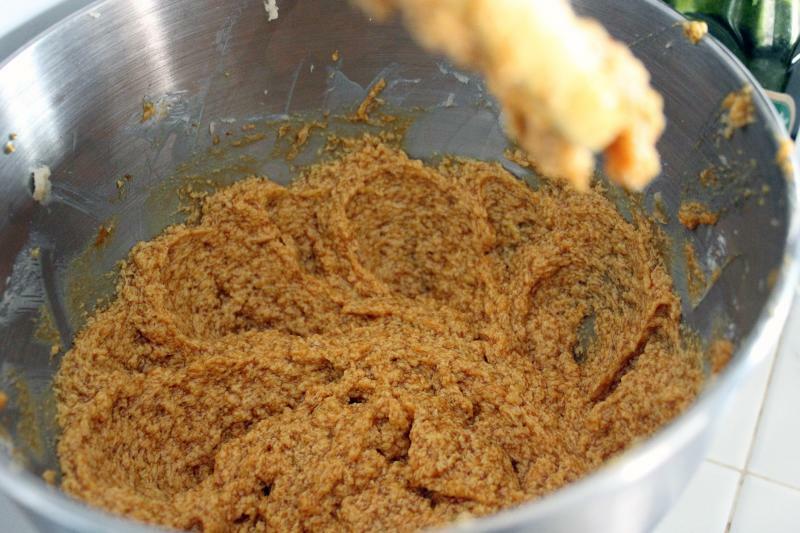 In a large bowl (a la your standing mixer), beat together the butter and sugars until well combined. Then, beat in the pumpkin. Add in the egg and vanilla extract and beat some more. Finally, beat in the dry ingredients until combined, but don't over mix that stuff. Cover the dough and refrigerate for at least an hour until firm. When your hour is up, preheat the oven to 350F. 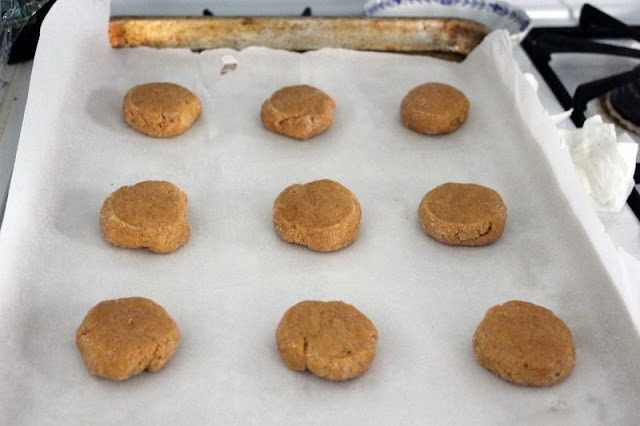 Line your baking sheet(s) with parchment paper. In a small bowl, mix together the sugar coating ingredients. Scoop the dough in about 2 1/2 tablespoon size amounts, roll into balls, and roll those balls in your sugar coating. 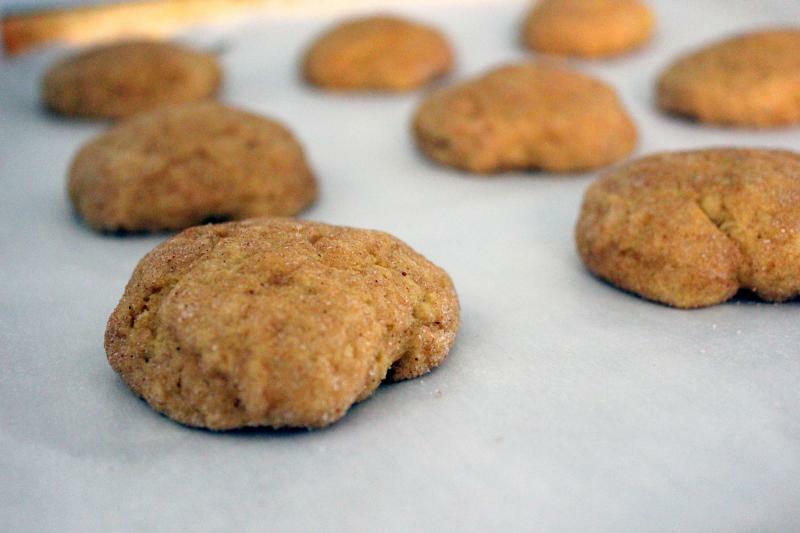 Place that on the baking sheet, leaving about 2 inches of space in between cookies. Then, either take a drinking glass with a flat bottom, moisten with water, dip in the sugar coating, and press down on each of the cookies, OR you can press with your hands and sprinkle some extra sugar coating on top. 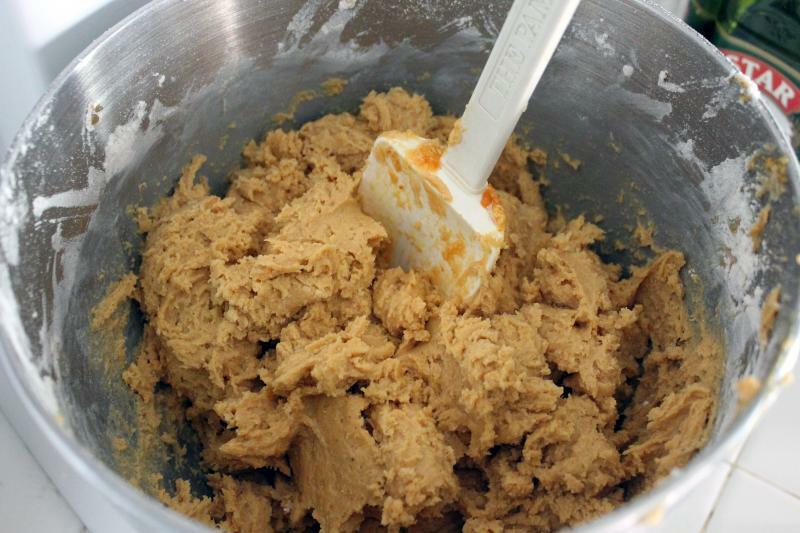 Bake the cookies for 10-12 minutes, removing when the centers of the cookies have set. Let cool on the pan for about 5 minutes, then transfer to wire racks to cool completely. 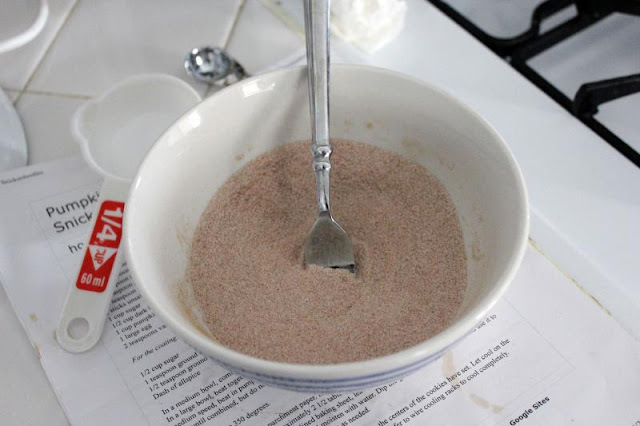 In a separate bowl, you should have mixed together your dry ingredients. Just pretend there's a picture of that. Then you're going to beat your butter and sugars together like above. Mix in your pumpkin, then your egg and vanilla. And then your dry ingredients. This dough will be very thick. Cover that up and stick it in the fridge for an hour. When your hour is up, preheat the oven to 350F and mix up your sugar coating. This is twice as much as you will have, because I only ended up using about half as much as the recipe called for. No need for all that extra sugar. 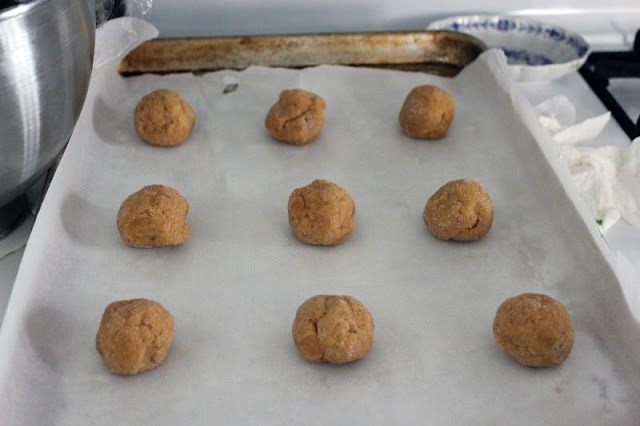 Roll your dough in balls, roll around in the sugar stuff, and place on parchment-lined baking sheets. Flatten out the tops - you can either do this with a moistened glass also covered in sugar, or with your fingers and then add some extra sugar stuff on top. They will come out looking like so. Let them rest on the sheet for another five minutes. Some of them I went back and pressed the tops in the sugar coating again after they had cooled a little bit. You can see those here in the foreground. Just a little extra sugary goodness! They are really yummy! And last for a long time before going stale, which is always nice.